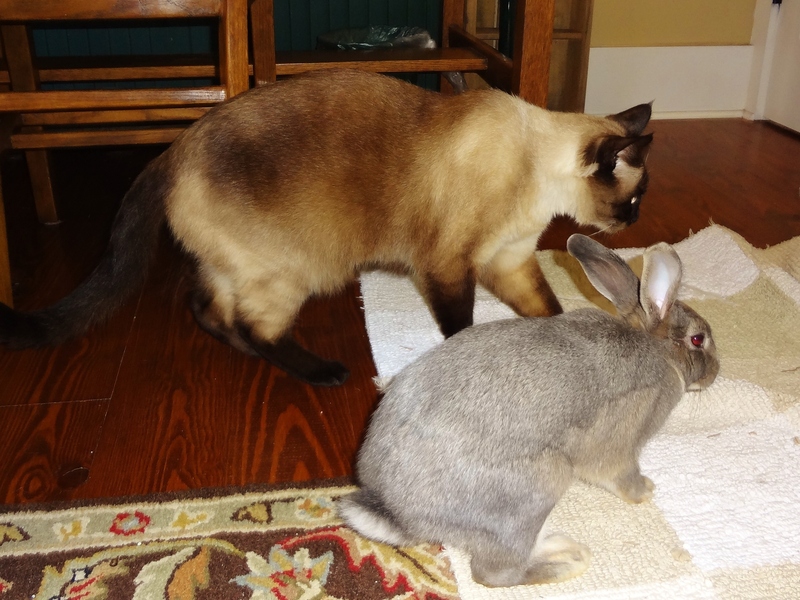 My house is too small to house two separate bunny habitats, so we are starting to introduce Buster & Graycie to each other in hopes that they make a love connection (or at least a “like” connection). This is one of the hard parts of having rabbits as pets because 0n RARE occasions, no matter how hard you try, you cannot get bunnies to bond. It’s not easy, but you have to keep trying for a long time and eventually, most rabbits will decide that it’s fun to have a pal to snuggle with, share treats, and groom each other. Our fist attempt was mildly successful. 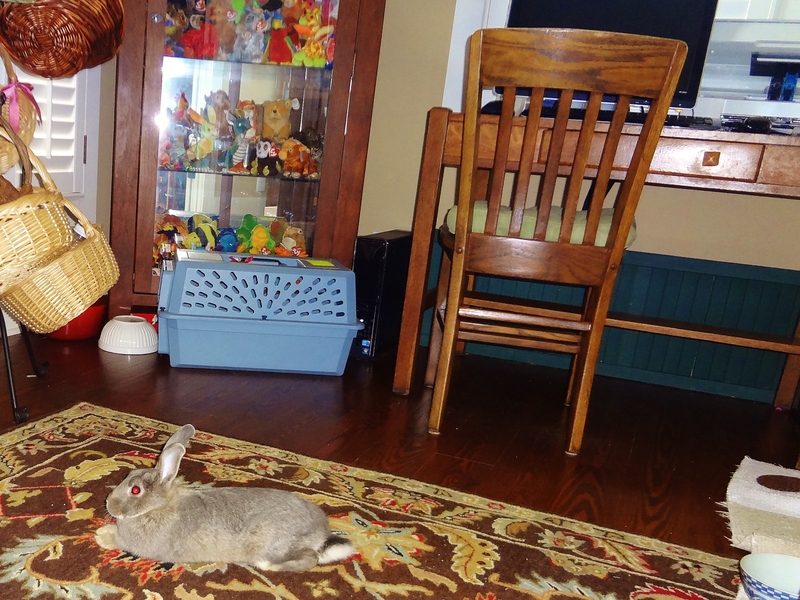 Listen Graycie, Buster is a pretty chill bunny. You gotta give him a chance, OK? Don’t worry Buster, we won’t let her hurt you. But I don’t WANT to share my salad! OK, maybe you can have a little bit. 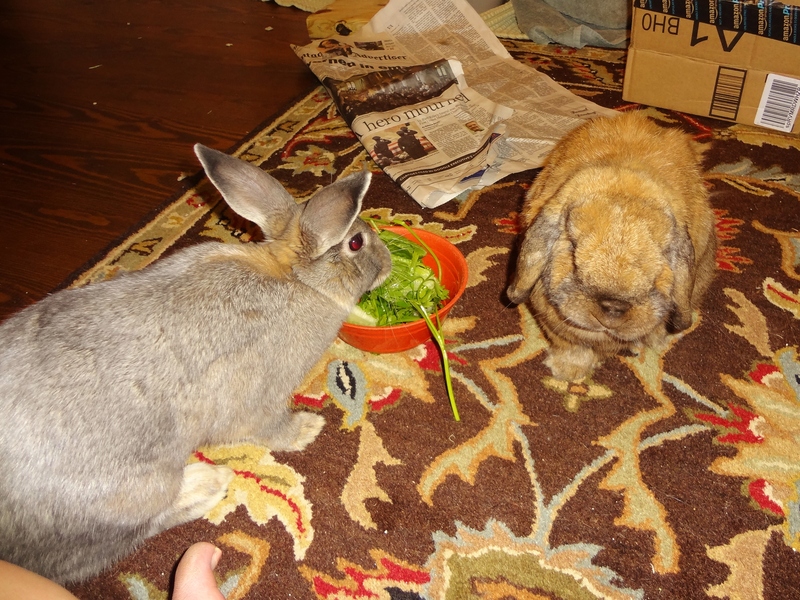 These two had a short snack together without any drama, but as soon as the greens were gone, Miss Graycie got all up in Buster’s bizness and he did not like it one bit! Since Jim and I were both sitting on the floor with them, we quickly separated them and put them back in their corners and no harm was done. Bunnies are STRONG, and they have teeth and claws that can injure in even kill another bun, so two un-bonded bunnies should NEVER be left unsupervised. 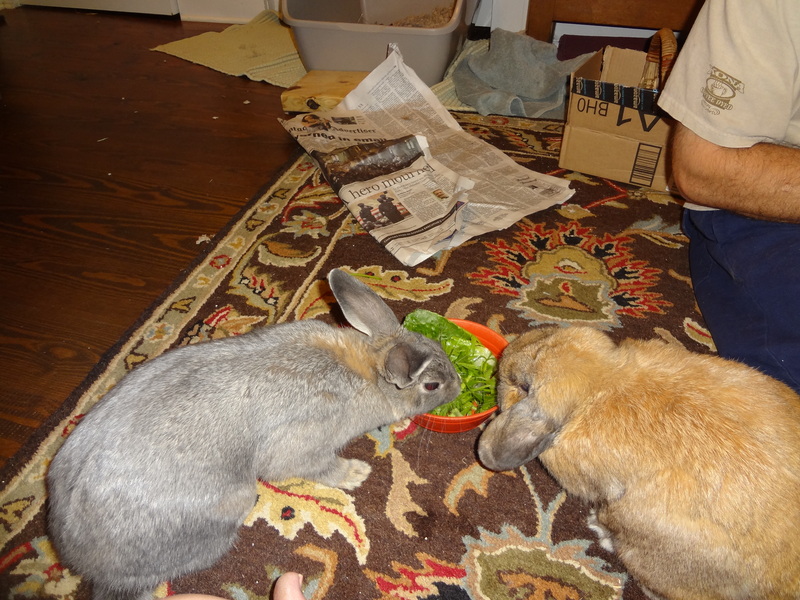 Plus, Buster is an old gentleman and Graycie is a young, willful, mischievous rabbit and she could seriously hurt Buster if we didn’t separate them. So, for now, Graycie has the office, and Buster is nearby in the hallway where he can see her and smell her, but they are separated by a baby gate. Until I procure some doggy fencing, from a friend, I’ve done my best to block access to all power cords (and there are many) in our office. I thought I had done a good job the first night Graycie stayed with us, but later in the evening when we couldn’t connect to the internet, we discovered that she managed to thwart my efforts and eat through some cables. So Jim got out his wire splicing kit (a must have for bunny owners!) and fixed the cables and I piled anything I could find around the edges of the outlets to keep GRAYCIE THE DESTROYER away from any cords. No, it doesn’t look too stylish, but it gets the job done. 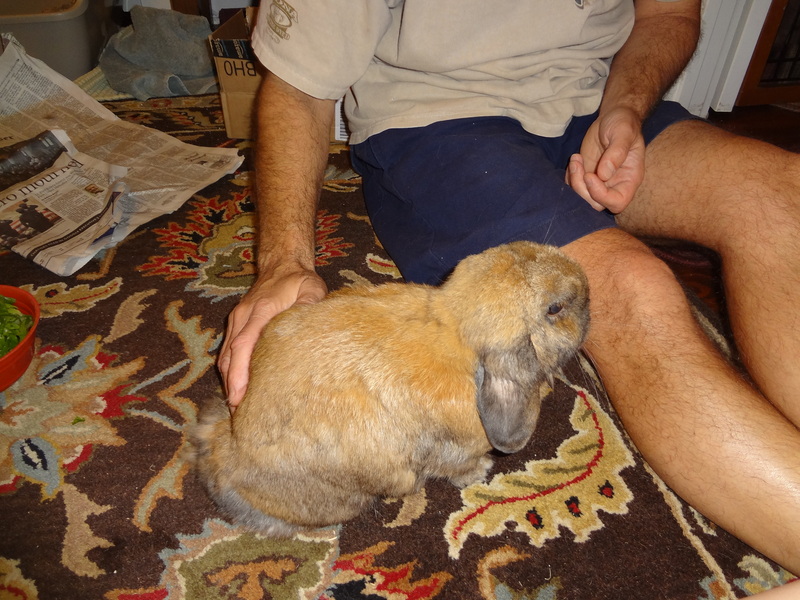 More on bunny socialization later. I wanted to share a recent EBay acquisition. 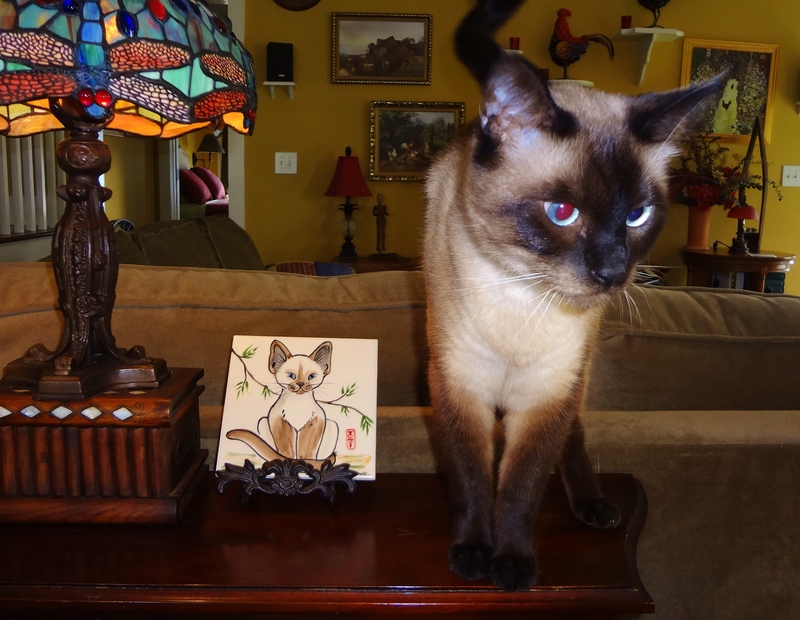 The gal who painted our awesome backsplash mural had a trivet on auction that I really needed! Over the years, we’ve gone through many, many expensive cables. My husband, Chris, finally came up with an inexpensive solution. He cut up some old garden hoses to cord lengths and slit them; they run from lamp, Xmas tree, etc… to the wall outlet. Doesn’t look great but it works! !